Children with dysgraphia often struggle to convey their knowledge through handwriting. Often they have a very sophisticated and comprehensive understanding of a subject matter, but they are simply unable to express this through handwriting. Using assistive technology for writing can help these students demonstrate their knowledge in effective and proactive ways. 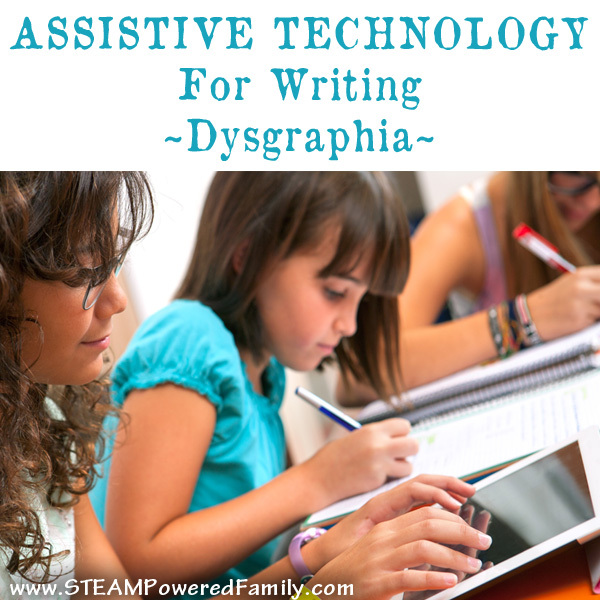 Beyond dysgraphia accommodations, there is a large variety of assistive technology for writing. These technology resources can be a huge benefit for school aged children but also for adults that struggle with writing. As an author I’ve often heard of adults using these tools to help them write productively during tight deadlines, while recovering from injuries and more. These tools can really help and there are new ones coming available all the time. Here is a list of tools to help you get started, and if you have suggestions for something I’ve missed, let me know in the comments. For young children consider programs that help them learn proper letter shaping. One of the struggles many students with dysgraphia have is starting their letters in the right spot and shaping them correctly. There are lots of letter tracing apps available, Little Writer is one well reviewed app. Learning grammar and punctuation rules can be difficult for those with dysgraphia. There is so much their mind is struggling to remember and apply, these rules can get lost in the shuffle. Finding ways to practice and learn these rules without actually writing can be really helpful. Punctuation – End Marks and Grammaropolis is one example of an app that teaches these rules in a fun way using drag and drop. With BitStrips shutting down I’ve been searching for a new comic creation tool. I am thinking of trying Pixton. My son, who loved making graphic novels but stopped due to his dysgraphia struggles, started making his stories again using Bitstrips and I want to find a quality replacement so he can continue using this creative outlet. I haven’t used Pixton yet, but I’m hoping it will be a good replacement for Bitstrips which was such an amazing tool. Creating comics online really helped my son organize his story lines, and practice many writing and story telling skills, without the struggles caused by his dysgraphia getting in the way. Planning and organizing a written project like a report is very difficult for many people with dysgraphia. Mind maps are a great way to help organize thoughts and ideas before writing, but since using mind maps involves a great deal of writing, I went in search of some apps that could help with this process. I discovered two promising apps: EDNA and SimpleMind. These would be great for older students that are writing longer pieces. Speech-to-Text software is a fantastic assistive technology for writing. There are many speech-to-text tools, in fact your device probably already has a tool installed. If not, Dragon NaturallySpeaking is a very popular tool, with good reviews. I first heard of this tool as an author, and now as a parent I see great applications with it for children that struggle with writing. Video Editing Software may not be exactly an assistive technology for writing, but it can be a very powerful tool for people with dysgraphia. Instead of having them write a report, have them film a presentation or demonstration on a subject, then edit it all together into a video that they can then submit as their proof of mastery on a subject. Typing can be hard for some people with dygraphia, but generally typing is much easier for those with dysgraphia. A quality typing teaching tool can help them master typing so they use a keyboard effectively. For my children we started using the free resource from BBC called Dance Mat. Once they became too advanced for Dance Mat we tried a few tools until we discovered Typing Instructor for Kids Platinum. It’s set up as a game and my boys really enjoy using it. Using computers as part of learning can be a great way to help people with dysgraphia. My son struggles immensely with math in part due to his dysgraphia. This year we are using a computer based math curriculum called Teaching Textbooks for his math. For a broad range of subjects, a fantastic free resource is Khan Academy. If you have a student struggling with doing traditional workbook/worksheet learning, look for computer based courses and studies. It might be exactly what they need to excel at learning the materials. Another app I have heard about but not used is SnapType, it helps students complete their worksheets by taking a picture and letting them complete it on a tablet. 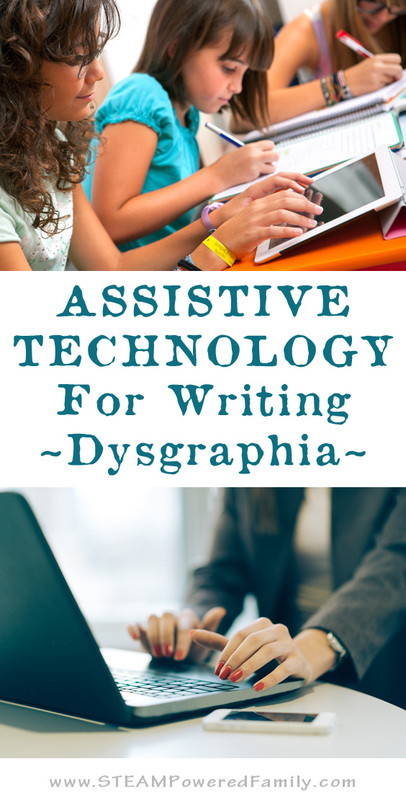 Looking for more assistive technology for writing ideas? The LD Online has an extremely comprehensive article and resource list here. 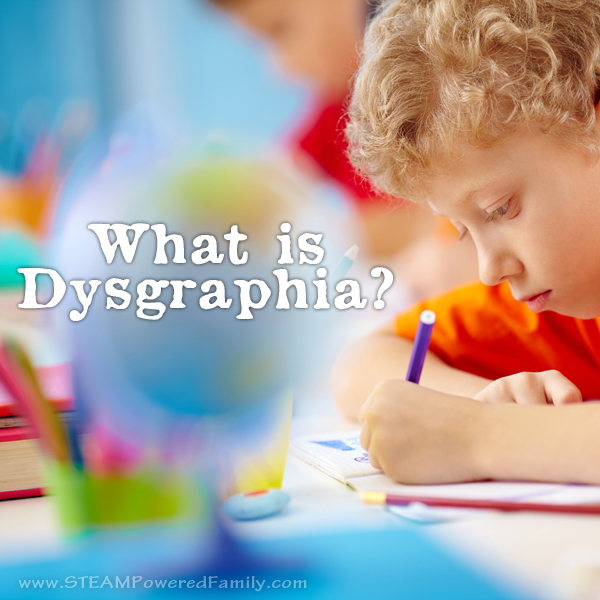 This article is part of a series, What is Dysgraphia? Read more about symptoms, signs and accommodations. I love Dance Mat Typing! Another free program, great for older students is Typing Club. I personally love snaptype. I’ve used it for my son with workbooks to turn them into digital forms he can use without the ststress and pain of writing. I am a nursery teacher in Nigeria Africa. I have two pupils who are not concerning in class whenever am teaching or other teachers from other subjects are teaching. Also this kids can not write the sound a or number 1. Please how do I make them to concentrate n also write.